You're being held ransom by your inner critics? The brake and the accelerator are on at the same time. You're going, yet you're STOPPED! AND you're using so much EFFORT being STOPPED! (Go figure!) Stuff that! You recognise the signs? Self-doubt, overwhelm, perfectionism, procrastination, the fear of failure, the fear of success or maybe a sense of shame and frustration that you're not getting it together, yadda yadda. It's time to play big? Your vision is ready and waiting. You realise that the results you want are too important to be held back by playing small. You're ready to step into your magnificence and play your true game of life. You know the world needs you to claim your power and get on with it. is an eleven week program designed so you achieve exactly what you want. You will already have experience of how powerful it is to access your courage and unstoppability. During our time together we will powerfully access that realm in ways whereby you identify and access your dynamic sources of strength to create a sustainable and fulfilling way to live. In addition, you have a powerful community of women who know what you are up for, and who are a stand for you to take the actions you require to achieve your goals. ​There are seven steps we go through that start with your needs and end with powerful delivery on your part where and how it matters. The results you want are what we create. You connect powerfully with your vision, your why. You map where you are now and the outcome you want. We identify and clear the blocks holding you back from living your best life. We clear those limiting beliefs, create a new relationship with fear and discomfort and connect with your authentic voice. You create what it is to be living powerfully on your terms and you practise being unstoppable. Together we set up the existence structures to have your effectiveness continue on, with the flexibility required to adapt to changing contexts. ​The approach is transformational rather than incremental, in order to connect with your own unstoppability, have the fundamentals in place and create the context and structures that support you in sustaining the difference you're here to make. The term that is often used is 'game changer'. Our work together provides the tools and empowering context for women to be their own inner and outer game changers - for their life and for the world around them. The focus is on simple tools and processes for transformation, and the actions that these tools will enable to achieve the results that matter. ​Following our initial strategy session, we meet for a 1:1 individual session where we identify your needs and create a plan and initial actions for you. There's also a soiree for women to meet each other and learn one of the key elements of the program. We then work and play through 10 weeks of live online sessions. The sessions consist of content delivery to the group, plus individual coaching for every participant. My coaching and stand for you for eleven full weeks. This includes between-session access for each participant. Online group sessions are held on Monday evening 7.30 pm to 9 pm Brisbane time (AEST), for 11 weeks starting mid April 2016. 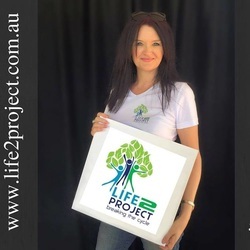 A private and supportive online accountability group where everybody gets together to share, learn and grow together. This online community continues to be available and appreciated long after the duration of the program itself as an empowerment structure to support you in staying on track and continuing to be unstoppable in achieving the difference you want to make for yourself and your world, and for you to contribute to the group. Access to a wider community of women, Women Howling at the Moon (WHATM). WHATM meets monthly in Brisbane with a feature topic and at times a guest speaker. The network provides an inspiring context to meet other passionate, reflective, outside-the-box women who are also committed to a sustainable life and making a contribution to their community/planet. For Unstoppable Women - On Your Terms participants, WHATM also enables further enrichment of the distinctions and learnings being explored during the our weekly sessions. WHATM includes an online component and a growing range of resources. A secured and confidential online private client portal enabling easy-to-track communication between you and your coach, and storage and fast access to your notes and to materials used during your coaching. Pre-session prep and post-session recap tools to enhance and anchor the benefits of the coaching session and build success. Access to a range of relevant resources. 30 day money back guarantee. If after participating fully, you do not agree the process is worth every cent of the price paid, let your coach know within the 30 days from your first coaching session to be promptly refunded the entire amount of the coaching agreement. An opportunity to calibrate progress, address inner blocks and take your understanding and unstoppability to new levels. Enhance your existence structures, have a heap of fun. Be inspired by who you are and what is now available to you. Leave delighted and with a new experience of who you are. I committed to do UW [Unstoppable Women] because I was running a small language school in Brisbane and failing. I knew I had a lot of baggage to do with success, taking money and being business minded. I wanted to overcome the programming of my Catholic training. Chris helped me to unpack those issues. Her mantra to step up and to be courageous resonated with me and I saw that I could be and do anything with the right attitude. As a result, ironically, I began to see the small school as limiting – closed it down and am now running a national foreign language film competition for schools, which I will also now take to NZ! Chris’s tools help me every day in juggling my family of 5 boys, staying on track with the Phd I am doing, completing my novels, paying attention to my health and spiritual goals and maintaining an arts practice. Unstoppable Women has provided me the tools and confidence to complete qualifications & further action my career, see and accept myself as others do, become more aware of who I am in the world, engage with people and no longer be reclusive, be present to now, reduce negative self-talk, get out in the world and live life on my terms (how wonderful & exciting that is). I can only see more positive growth, change and life experiences as I continue to action the tools gained. Each day I see more of the awesome true real me. ​Everything has changed for the better; it’s more amazing than I’ve ever dreamt. My sincere thanks Chris. My big vision is to provide support services and a healing centre for women getting back on their feet after domestic violence. I was in action making it happen, however I was frustrated and exhausted and felt like a boat without a rudder. I didn't believe in myself and felt like an imposter without formal qualifications. I was hiding my feelings and opinions as I've always shied away from anything I see as conflict. feeling. And I wasn't attracting the level of assistance I needed. I now see that my own self-beliefs were keeping me small and I can recognise and deal with them. Through the Unstoppable Women program, Chris led us through questions, learning experiences and action that enabled me to make a big shift - and to feel safe and supported while it was happening. Inspiration....that's what I'd lost....and I needed to regain it. I have always aspired to writing books and that has been my dream and my aim, but I have had dyslexia since I was a child...and talking in your second and third language of course, it always comes out that you can never really express your true feelings - not that I can say that even in Finnish... I really wanted to write a book in English. But I needed help with that. So that was my big challenge - overcoming these, expressing myself in another language so I would actually get my message through. ...and I had lost my community..I was totally disconnected from it and I needed that, particularly to do a book about social change, transformation. And ... I needed a coach. I accept that when the student is ready, the teacher will appear. ...It was YOU..yeah...the deep understanding that you took my cause and - it is really moving - you helped me - REALLY [tearing up] - and I am grateful. You need a catalyst, yeah, and in my case it was Chris Henderson. You need something like this impulse and you need the inspiration. Elina's Unstoppable Woman goal was to write her first book. The book, entitled "Love on the Line: How to Recover from Romance Scams with Dignity and without Victimisation" will be published in January 2016. Thank you Chris. . . for your encouragement, your sense of fun, and your prodding to get me back on track. The courage you display in your own work is infectious and inspiring. 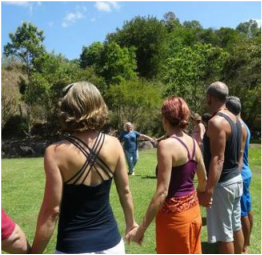 Thanks to your Unstoppable Women program, the private coaching, a supportive on-line coaching group, a two day workshop and the joyous Women Howling at the Moon events, I have revamped and relaunched my “Mindseeds” program. ​It's 'all systems go' and lacking courage is not an option any more! I've struggled with depression and anxiety most of my life, and that feeling of not being 'good enough' that is familiar to many. Despite this I have been ambitious about making a difference for others - pursuing a career and ongoing studies in education for social justice and violence prevention. As a 'survivor', researching and writing a thesis about the intersecting personal and political dimensions of agency for change has been an emotional journey. I had been feeling tired and stuck though - at times even hopeless about achieving my goals. My research led me to understand how important it is to take care of myself and to allow others to help me... that everything we achieve is in relationship and in community. Chris inspired me to work with her because she is such a vibrant model of positivity and possibility. I have particularly enjoyed the personalised and sensitive guided reflections and also the opportunity for reflective conversations with other women participating in the coaching program. The empathy, validation and stimulation I experienced in this context has been very empowering. Since I've begun the Unstoppable Women coaching journey I've noticed my responses to formerly anxiety provoking situations have changed. I have established a much more healthy relationship with myself. My thesis writing is progressing, I'm happy and relaxed, and I'm managing to cover other bases too. This is an investment for your life. If you register three months ahead, you gain three months' extra support! book a complimentary 40-minute discovery session.